Is Leather Furniture Expensive To Clean And Maintain? 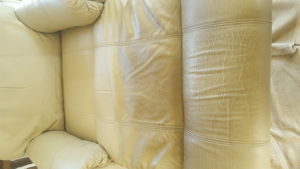 Like our Wollongong customer, you probably invested in a leather lounge because of its luxurious looks and durability. The main reason you buy expensive items like leather furniture is that you want it to last a lifetime. You want a one-time kind of investment for your home that is easy to maintain and clean. Always dust your sofa with a soft cloth and focus on the crevices where dirt and dust have settled. Use a quality leather conditioner on your leather lounge to prolong its lifespan. Wipe any dirt and spills with a microfibre cloth as soon as they happen. Avoid exposing your leather upholstery to too much sunlight because it will dry out the leather. Be careful with store-bought cleaning products; always spot test before you apply a solution to your sofa. Call a professional upholstery cleaner regularly. You probably have no idea how much dirt and dust your regular cleaning can miss. Your furniture may not look dirty on the outside, but it can be a breeding ground for bacteria and allergens because of deep seated dirt. Regular shop-bought cleaning products might damage your leather upholstery because of toxic chemicals in the solution. Professional experts are the best people to take care of leather restoration. 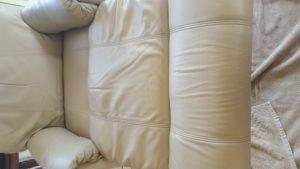 Our customer in Wollongong understands that calling Jason & Tanya on a regular schedule for professional cleaning is the best option to protect his investment in his leather lounge. ChemDry leather lounge cleaning makes a big difference! First, he pre-tested the leather for colorfastness in an inconspicuous area. Next, he sprayed Chem-Dry Leather & Vinyl Cleaner and rubbed it in. Jason reapplied the cleaner as needed, being careful with any signs of colour transfer to the cloth. This product is only available to professional technicians because it is stronger than you can buy off the shelf. Then Jason rubbed all the solution off and dried it thoroughly using a clean, white hand towel. 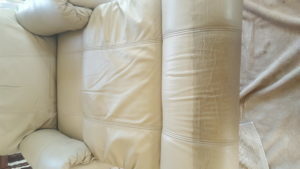 Finally, when the cleaning of the whole couch was complete he applied Leather & Vinyl conditioner all over for protection. Please note when leather is cleaned it always needs to have conditioner reapplied to protect the leather.